A couple months ago I spied a little jar filled with bring yellow liquor and a cute tags swinging from its neck. I was hooked. After pinning the photo and staring at it forever..I decided to give it a try. I love the idea of making handmade gifts, that, and the love of booze (fruity booze!) 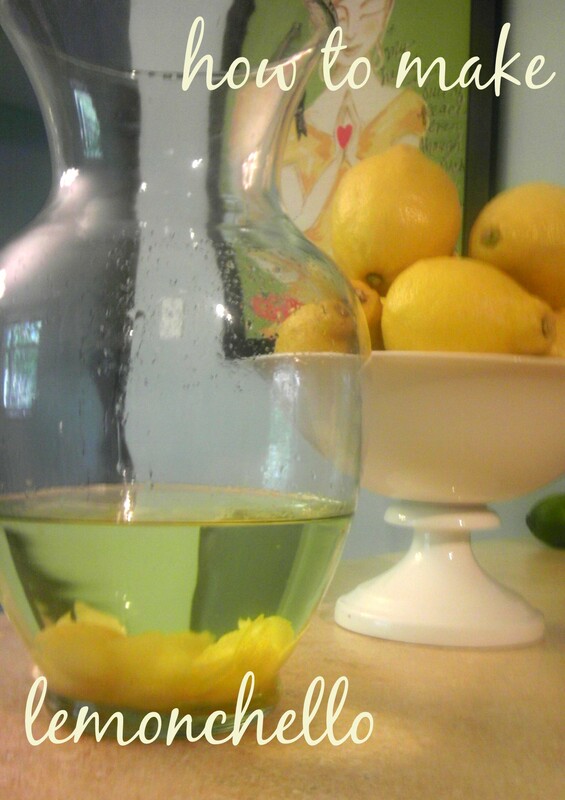 inspired me to make lemonchello and give it away consume my fair share for Christmas. I realize if you are my friends or family and are reading this, the gig is up. If you’re reading this and don’t get any, its because I drank your gift. I found a tutorial here and I followed his proportions pretty well. Making flavored liquor isn’t difficult, it just takes time to merry together, so start planning early. 1.5L of vodka – I used 80 proof because that is as high as it gets in Ohio, but some people recommend a blend of Everclear and a more tame liquor like Smirnoff. 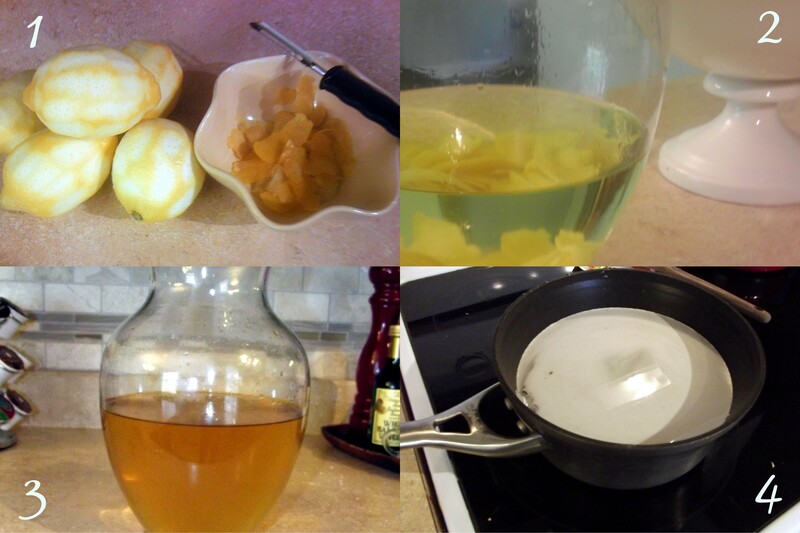 Start by washing your lemons in hot water, and using a potato scrubber to get all the wax off. I ended up heating water in a kettle and dumping it on the lemons twice, scrubbing really well, and removing as much wax as possible. Peel the rind of your lemons with a knife or peeler, careful to get as little of the sour pith (white part) as possible. Its the oil in the rinds that give it the lemon flavor and color! Combine your alcohol and your rinds in a large glass jar. Yes, I used a vase. Yes, I washed it really well first. Let your mixture sit for 2 weeks t0 3 months. The longer you can let it sit, the more lemony and mellow it will be. 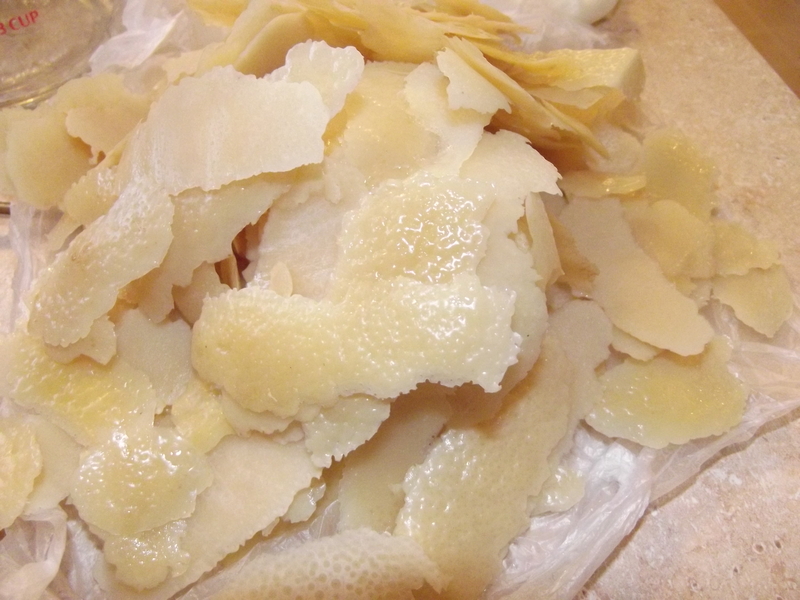 I let mine sit for about 2 months, stirring it every couple weeks to expose alcohol to the rinds. Apparently the mixture is done when your rinds are depleated of all oil and they snap like potato chips. Mine never got that hard. After you have discarded your rinds and strained the mixture through some cheesecloth, add the simple syrup. Boil 4 cups water and 4 cups sugar to make the syrup, and let it cool. Add the syrup to the alcohol and let merry for another week or 2. Now you can bottle your mixture right when you add the syrup, or wait till its hangs out a little longer. I’m waiting just a little longer. Serve your Homemade Lemoncello ICE COLD from the freezer. I’m hoping mine won’t freeze in the freezer, I think that is the advantage of using Everclear (or as high proof alcohol you can afford). yours is being hand delivered!